A CPAP machine is designed to help sleep apnea patients breathe more easily and sleep more deeply throughout the night. It can be a life-changer for sleep apnea patients. Unfortunately, it can take you some time to acclimate to the machine when you first begin using your CPAP machine and mask. Some common CPAP mask problems may result in unnecessary discontinuation of the breathing therapy. Fortunately, most problems caused by CPAP have simple solutions. Chronic nasal congestion causes many people to discontinue use of their CPAP machine, but adding a heated humidifier to the machine can solve this problem. You can also use a saline nasal spray before bed to ease congestion. Sometimes, your doctor may prescribe a nasal steroid spray to ease congestion if humidified air does not help. Dry mouth generally occurs because of mouth breathing during CPAP use. Using a chinstrap to hold your mouth closed will prevent mouth breathing and ease dry mouth. Switching to a full-face mask or using a heated humidifier can also relieve the symptoms of dry mouth. A leaky, dirty, or poorly fitting mask can lead to skin irritation, pressure sores, and pain. Try adjusting your CPAP mask straps to obtain a better fit, and clean your mask regularly according to the manufacturer's directions. Let your doctor know if you experience deep sores or if you develop signs of infection, such as a fever, discharge, or increased swelling and redness. 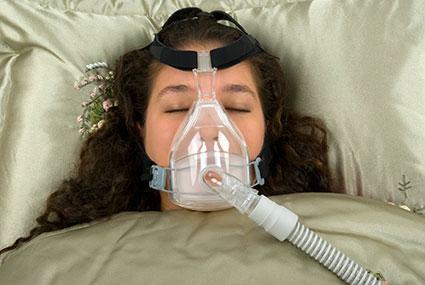 CPAP masks that cover the entire face make many users feel claustrophobic and prevent sleep, especially during early months of the breathing therapy. To help reduce feelings of claustrophobia, practice breathing through just the mask, and then attach the mask to the machine when your comfort level increases. Changing mask styles may also help, and using relaxation techniques before bed can help reduce anxiety. The constant pressure may cause headaches or ear pressure; this is more common if you are already congested from a cold or allergies. Decongestants may help with this temporary congestion. If not, you may also have to skip using the CPAP until the cold or allergy resolves itself. If this problem continues, you should speak with your sleep specialist. While sleeping, you can swallow air and experience bloat and significant gas in your intestines. To avoid this you may need to adjust your mask or lower your CPAP pressure. You may need to consult your physician about your settings. Other CPAP problems may be related to the machine itself. Older CPAP machines tended to be very noisy. Most newer CPAP machines are fairly quiet and rhythmic. However, that does not mean that the noise that is present may not be annoying to you or others in the home. Check the air filter to make sure that there is not a machine problem causing the noise. You can also try to move the machine further from the bed or try or mask the sound with a white noise machine. You or your bedmate can also try earplugs to reduce any irritating noise. Some people find it difficult to breathe in the presence of constant air pressure. You can try gradually increasing the length of time you wear the mask each night, or you can try a machine with automatically increasing air pressure when the machine "ramps" up the air pressure to the appropriate level that you need. In most cases, your sleeping problems will decrease as you adjust to the sensation of pressurized air. Your sleep specialist may switch you to another type of CPAP machine or positive pressure if you are unable to adjust. For many people, the worst position for sleep apnea is sleeping on your back. However, other positions may interfere with the function of your machine. Sleeping on your side may break the seal of the mask causing leaks or a decrease in pressure. Sleeping with your head near the end of the pillow may lessen the risk of breaking the seal; there are also be specific pillows available for use with CPAP machines. The tube of the CPAP machine may also get tangled up with you or your bed partner. Placing the machine directly behind the bed and running the tube over the headboard may be one solution. Your sleep specialist may be able to help adjust your machine for whatever position you sleep in. One of those most common CPAP mask problems is incorrect fit. If the mask is too large or small, or if it is the wrong shape for your face, it may cause skin irritation and discomfort. The pressure of the air escaping the seals can also irritate your eyes, leaving them red and sore in the morning. Check to make sure that your mask fits well and that the mask seals have not softened from wear. It might be time to get a new mask if it no longer fits correctly. Different types of masks are also available, with some worn over the entire face and some designed to cover only the nose. Try on different styles and sizes to determine the best fit for your facial features. Facial hair and oily skin can also affect the fit of your CPAP mask. You can use a nasal pillow mask to reduce how much of the mask touches your face; wash your face regularly with soap and water and clean your mask thoroughly each morning to reduce build up of oil on the mask. Shaving excess facial hair for men may also be necessary for a solid fit and comfortable night. In a portion of sleep apnea patients, the CPAP option simply doesn't work. You can spend months adapting to wearing the mask, sleeping with it on and keeping it on through the night, only to continue to suffer from sleep apnea. This may mean that you will require a different type of treatment for sleep apnea. CPAP works for most patients, but not all. Getting a good night's sleep is important and if your CPAP machine is not working for you, talk to your doctor about your options as soon as possible.